Man, I hate Joburg traffic! It is the most ridiculous thing ... I want the traffic from quiet December back. This morning it took me barely under an hour to get to work. Who knows why ... I'm guessing it was one of the many, many electricity issues we're currently experiencing that is affecting the traffic lights. Either way, all the lights I went thru were working, but the traffic was still backed up. And there are no sneaky sneaky routes left. Me & my handy map-book, I thought we could out sneak all these Joburg locals. No such luck. Every round about, traffic avoiding route has been found and is now subsequently catering to you and your 500 colleagues! 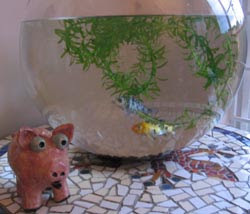 In other news, I cleaned my fish bowl last Thursday ... the water had turned a rather murky green to the point I could only tell that there were any fish living in there when they came up to the side to wriggle hello. It appears that after a crystal clear week the water is turning the same unsightly green ... perhaps it has to do with their position in my room, I'm hoping I can just move them out of direct sunlight - I presume that's what's causing the fuss. Ah, but if you became Minister of Transport then you would flit around in your very own helicopter, laughing at the poor drivers stuck in traffic jams below you. I think the primary role should be to establish safe & affordable public transport ... and sort out the annoying taxi's, I hate that they think their need to get somewhere is so much more crucial than mine. No more driving in the yellow lane! Blegh!